Following a string of fund-raising and a push into mobile, Zalora, the Southeast Asia-focused online beauty and fashion store started in 2012 by Germany-based startup accelerator Rocket Internet, has launched an Android app across the region today. The Android version follows closely behind Zalora’s iOS app launch in April this year, which rapidly became the top lifestyle app in Singapore, Malaysia, Hong Kong, Indonesia and Vietnam. It also launched a mobile site earlier this year. The company’s push into mobile comes as it raised a huge funding round of $100 million two months ago from regular Rocket co-investors Summit Partners, Kinnevik and Tengelmann Group, along with Verlinvest. Our developments in the m-commerce sphere earlier this year have proven to be the right move for us — now almost 25 percent of our revenue across the region comes from mobile. The Android app allows users to receive push notifications regarding new arrivals and flash sales, add items to their shopping cart and infinitely save them for later, as long as the app is kept active, and get a quick overview of product information and ratings. The app also uses the built-in capabilities of the Android OS to create native animations such as the “add-to-cart” action. The company said it will also be launching a redesigned version of its mobile site in August — which will feature additional filters, a multi-step checkout process and social sharing. With its focus on Southeast Asia, mobile is a key component of growth for the fashion e-commerce startup. The adoption of smartphones continues to grow in Southeast Asia at breakneck speed, according to a GfK report which found smartphone sales across the region grew 61 percent over the past year. 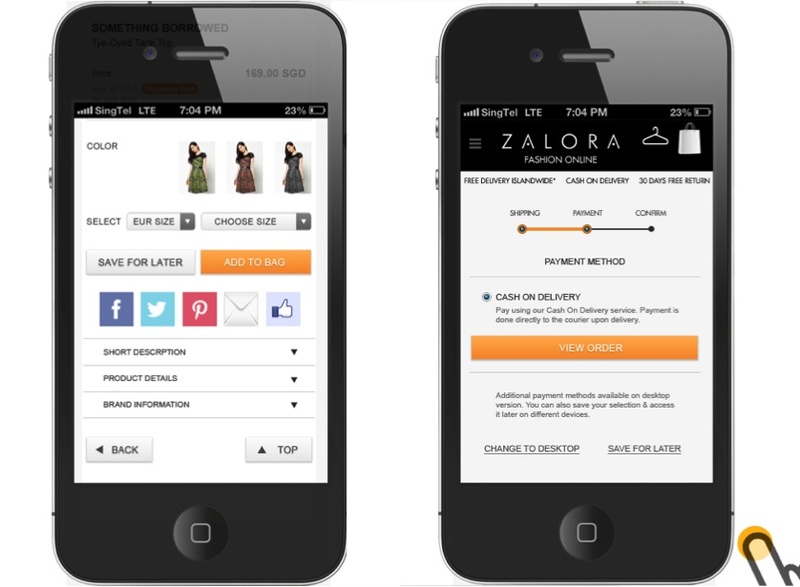 Zalora’s Android app has also been long-awaited, given that Android is the dominant platform across the region. According to GfK, Android accounted for 70 percent of smartphones sales over the past year — up from 50 percent last year.